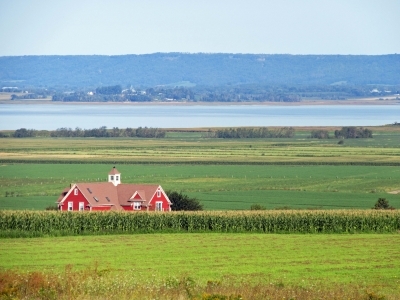 The Landscape of Grand Pré is a polder created for farmland by the Acadian community. Originally a Marshland inhabited by native Mi’kmaq people, the reclamation of the land was carried out in stages in the 17th and 18th century. It is considered the best example of a historic polder in North America. It is still a living Cultural landscape of farming. Grand Pré is also the place of memory for the Acadian diaspora. These descendants of the 17th-century French colonists were deported from here in 1755 by the British colonial officers. This site is in a marshland area on the south shore of the Bay of Fundy, close to Wolfeville, being pleasant and historic and would be a good place to stay nearby. The Visitor Centre at Grand Pré is impressive, especially its multimedia exhibits of the brilliant diking systems of the Acadians and in-depth explanations of their cruel expulsion by the British from the lands they worked so hard to tame from the sea. 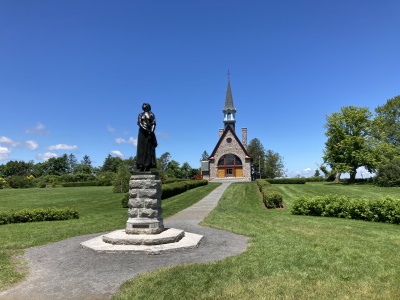 There is a pleasant walk along beautiful grounds to see the Statue of Evangeline, a re-built church dedicated to the memory of the Acadians, and a rustic blacksmith shop. Atop a hill, overlooking the Sea is a panoramic vista of the Acadian farmlands. The UNESCO plaque is also to be found there. Inside the church were some paintings with lines from the poem, “Evangeline”, which were moving. In fact, this whole site was touching and brought to mind one of the many examples of man’s inhumanity in our sad history. They were caught between two great powers in the 18th century, and so the French Acadians of Grand Pré fell on the wrong side of history. The French settlers had constructed dykes to improve farmland along the coast of the Bay of Fundy, and established trade ties with the British to sell their agricultural bounty. Nevertheless, the Acadians were unwilling to cut ties to the French, and were thus unceremoniously rounded up and exiled from the land they had built. I was familiar with the story of the Acadian diaspora from history classes in school, but it became much easier to envision after visiting the museum at the Canadian national historic site at Grand Pré in September 2017. The museum includes a film about the deportation, while the nearby memorial church displays artifacts and stories from the settlers. I climbed the trail above the site to a lookout (with the World Heritage plaque) in order to view the rich farmland left behind after the British expelled the settlers and burned their villages; the tranquil setting today belies the tragic history. A cross in nearby Hortonville commemorates the Acadian deportation, but Nova Scotia's loss was a gain for the United States, as many of them moved to Louisiana and created a distinctive Cajun culture. Logistics: Grand Pré is about an hour northwest of Halifax, and can be reached by private transportation; once there, the museum, church, and lookout at the national historic site are all connected by footpaths. Grand Pre is a cultural landscape located in the northeastern part of Nova Scotia, on the southern shore of Bay of Fundy. This part of the province is not very crowded and the landscape itself is not spectacular, especially comparing to the beautiful ocean views in the south. The site is connected with the history of Acadians, French settlers of this place, expelled by the British in the middle of 18th century. The World Heritage Centre is devoted to the history of Acadians, their daily life and exile. Then, visitors may walk to the surrounding meadow, garden and church (actually, serving as another museum of Acadia rather than as a place of religious ceremonies). The historical part was quite interesting but I am sure that if was not inscribed as WHS, it would not attract many tourists. Being there do not forget to drive along the polder to the sea shore, which during early summer is a place of stop for thousands of migrating birds (I did not see any in September). By the way, the WH centre informs that the place is the newest WHS in Canada, which is not true since Red Bay Basque Whaling Station was inscribed in 2013. As a direct descendant of those deported in 1775, I finally felt like pieces of my life had come together and I had a real connection to my past. When I arrived at Grand Pre, I felt like I had come home. It was also a very humbling experience to walk where my ancestors lived and eventually left from.The land where I grew up in Louisiana had always been important since this is the area my family settled after leaving "Acadie". Now I know why. The beauty of Grand Pre was indescribable. It is a place I want to return to again.